One significant issue we often note, is that when it comes to resources and case studies, no “one stop shop” has all the answers. Nor could it, since we all have diverse backgrounds, and in essence different (yet, at times complimentary) points of view. Since we operate in various environments and threats are highly contextual – what may be considered a significant threat for one principal or asset, may actually be insignificant for another. First, there is the investigative aspect of protective intelligence. This includes following and testing new investigative methods, as well as evaluating our own protection strategies in light of how an adversary could leverage those same methods in a malicious manner. We can avoid complacency and remain vigilant by reading the work of others and by sharing lessons learned with our colleagues. Third, there are plenty of established sources regarding intelligence collection & analysis, intelligence writing, and expedited sharing of such data. Our point of view is that information is worthless if it isn’t shared with relevant parties at the appropriate time. So, not only do we as security professionals need to communicate in a timely manner, but we need to do so in a common language, so that the right risk mitigation actions can be taken by our counterparts. 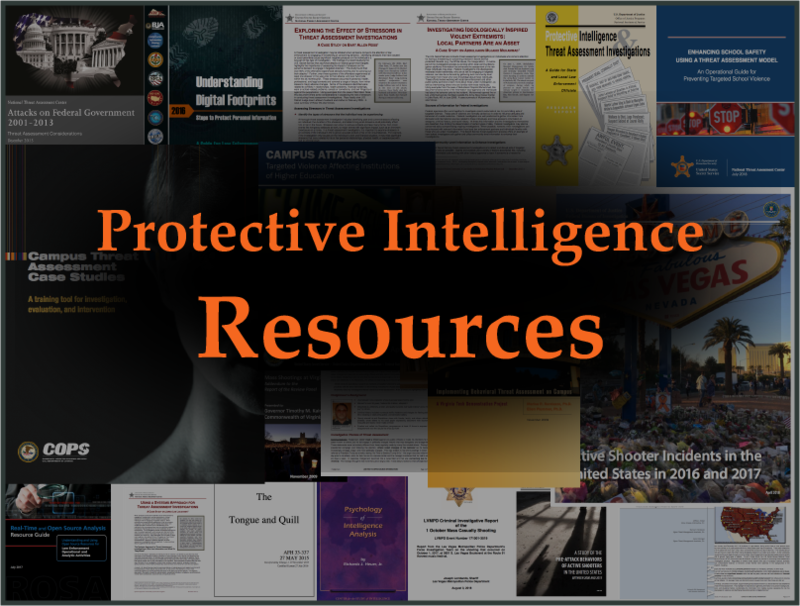 Below, you will find a concise protective intelligence resource list broken down into the following categories: investigations, studies about violent behavior, and intelligence. We acknowledge that this is not exhaustive, and we welcome your feedback and collaboration in improving it. Please leave us your comments at the bottom of the page and we can make updates accordingly, as well, please share with your colleagues, it would be great to continue to update this list for all to benefit. Twitter excels as a platform for feeding us the latest information about various topics. So, it’s no surprise that we follow a range of influencers in the investigative space for the latest and greatest. To make this content easier for you to consume, you can view our public Twitter list with the following personalities already input for you to follow: Ontic OSINT Twitter List. Protective Intelligence & Threat Assessment Investigations: A Guide for State and Local Law Enforcement Officials (1998) by Fein, R. A., & Vossekuil, B. In the course of our careers, we have observed that it isn’t enough to just read the literature – it is critical that we collaborate with our teams to find creative ways to apply the most important ideas we take away from these readings, to improve the quality of our work product and our processes. In addition, it is also not enough to simply forward a set of PDFs to our analysts and expect them to absorb the information in a meaningful way. It’s up to security leaders at all levels, to create a culture of continuous learning among our teams, rather than a culture of top-down “read this, read that.” We are confident that you will find excellent information among these up-to-date and thoroughly researched pieces from our collection above. Please share your thoughts in the comments section below and let us know what some of your favorite resources are.